A while ago, my Grampa asked me to tell him exactly what arepas and patacones were. At first, we thought all arepas were deep fried with different things inside because this is what we ate all the time on the coast. A few times a week we got arepas for breakfast from a place on the street near our house. We saw the lady shaping the dough into circles and then a man fried it until it puffed up, and then another lady made a hole in it and put the egg or meat inside. But when we travelled around Colombia, we learnt that asking what arepas were like was a bit like asking what is bread like? I mean by this that you can get brown bread, white bread, bread in sticks or rolls or loaves, bread with olives in, or raisin bread or even chocolate bread! So bread can come in all different shapes and flavours and so can arepas. Each region of Colombia has its own speciality for arepas and we tried a lot of them when we travelled around. Our favourite kinds were fried with meat, filled with egg and sweet aniseed ones. We also liked cheese ones. Even though we ate arepas all the time, we didn’t know how to make them until we went to live with Diana for a week and she showed us. This is a video to show my Grampa but we thought you’d all like to see it (you can also hear me speaking a bit of Spanish in the middle bit). Patacones are pretty much always the same, but we still didn’t know how to make them, but we do now. They are pretty easy. One of the foods we didn’t try during our trip was a delicacy that they eat in some parts of Colombia that we only found out about when we got back. The dish is fat bottomed ants! We didn’t try this but when I read about it today it reminded me that we spent lots of time looking at live ants in Parque Tayrona and other places in Colombia. In Tayrona there were loads of enormous termite nests and ant colonies around the place we were staying and there were millions of red ants in each one! Brae and I spent a long time watching them and we saw where they went to get food, how they cut up the leaves and where they lived. They had cleared little pathways in the undergrowth in between their food source and their nest and we spent time following their paths. We made a film of their activities (and at the end you can see a glimpse of the amazing Blue Morpho butterfly we saw, but they were very difficult to film). When we were in Tayrona we walked for hours every day to see the wildlife and we watched the birds and mammals mostly, but when we couldn’t see any we were happy to watch the bugs. 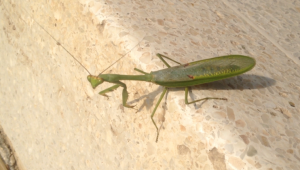 One example is that when we went to get our breakfast one day we saw a praying mantis! It was really cool because I didn’t think we were going to see one and I have read a lot about them. 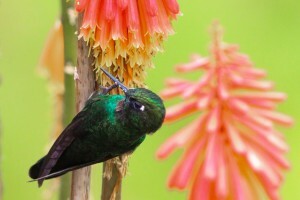 They are the predators of the insect world, so I guess that makes them the insect equivalent of a lion or a shark! We also saw, on our morning walk, a dung beetle rolling dung to its house, but it kept on going round in circles! Lots of people don’t like bugs so they probably wouldn’t have enjoyed the insects, spiders and lizards that filled our cabin at night! 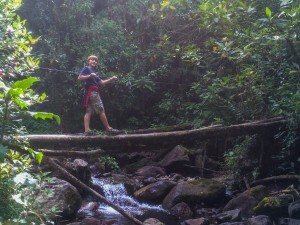 We tried to tell ourselves that we had to get used to it because we were in the middle of a jungle and the insects lived there and we were their guests. 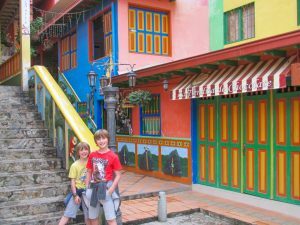 We went to a very famous place in Colombia called Guatapé and it is special because of all the decorations around the houses. The bottom of the houses all around the town have painted sculptures of animals, farmers feeding animals, vehicles or local places. 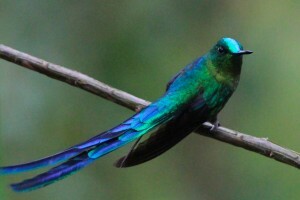 It is also famous for a dam that they built in the 1960s and it makes almost a third of Colombia’s electricity. 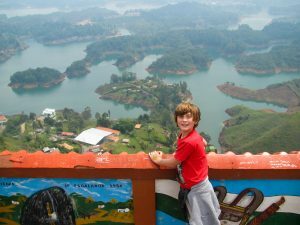 When they built the dam it flooded all the valleys and lots of Guatapé and its surroundings so the landscape has lots of lakes. Some houses and towns ended up underwater and we heard that the only bit of the old village you can still see are the tops of the hills and the spike of the church tower sticking out of the water. We went on a boat around the lakes but we didn’t see it. One very big hill, high above the water, is called ‘el Peñol’ but people also call it ‘la Piedra’ (the rock). 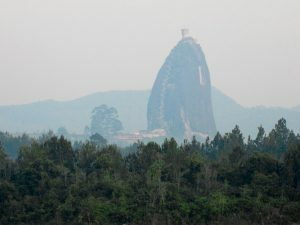 It’s quite amazing looking because it sticks up so much higher than everything else and I guessed that it was flung out of a volcano and we found out that I was right! 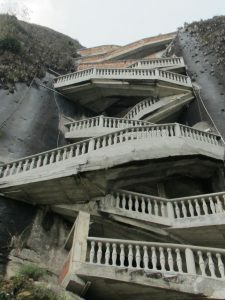 We heard that you could climb it, because someone had built stairs in a gap in the rock, so we did. We climbed up and I got there really quickly because I ran up but everyone else went really slowly. At the top there was an amazing view and we learned that there were six hundred and fifty steps and there was a tower at the top that was about fifty steps so I had run up about 700 steps altogether! 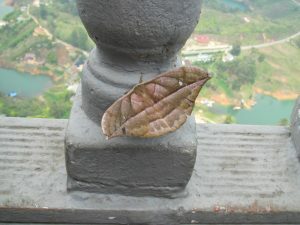 At the top we were about to go down when I saw a moth that looked like a leaf. It was really cool and we were quite surprised as it seemed very strange for a moth to be this high up. 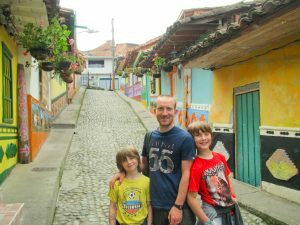 Guatapé was one of our favourite-looking ‘pueblos’ (which means towns) but we went to quite a few other beautiful places too, like Ráquira which is famous for mud and pottery, Salento (where we played Tejo), Filandia and Villa de Leyva which has the largest cobbled square in all of South America. One time, when we were in Barranquilla, we were on our way out when a man walked out of the hairdresser next door and started to talk to me. 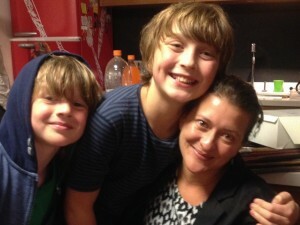 After about 10 minutes, my mum got off the phone and he said to her (in Spanish): ‘What lovely boys you have. They are really good at speaking Spanish. It’s my birthday tomorrow, would you like to come to my party?’. When my mum said that was really kind he replied ‘mi casa es tu casa’ which means ‘my house is your house’ and he offered for us all to go and stay with him and his family. When we said we were fine where we were staying, he told us that if we had any problem, we should come to him (he lived across the road from where we were staying) and knock on the door even if it was 2 o’ clock in the morning! Then he showed us around the neighbourhood. The next day we went to his party and we ate lots and danced with his daughters who were really nice too and met some of his friends (also really nice!) and when Brae got tired he said he should go inside to have a sleep so that my mum and dad could stay up late at the party! Another time, we were trying to get home from Parque Tayrona and saw a bus pull up. We asked how much the tickets were but it turned out to be a private bus for some students from Boyacá. Even though we were just random people from the public, they said we could ride in their coach all the way to Rodadero where we lived (more than an hour away). 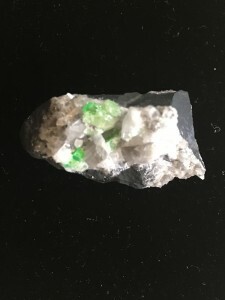 On the way, my mum was chatting to some of the students and because they studied geology she told them Brae was in Emerald class and he wanted to bring an emerald home from Colombia to show them (they don’t really have amethyst mines in Colombia, so I can’t bring one back). The girl suddenly rooted around in her bag and pulled out a stone, studded with little emeralds! We thought she was just letting Brae have a look but when we tried to give it back she said “no, keep it”! We have already told you about our taxi driver Javier (he drove one hour in the opposite direction to get a photo of shark oil for our blog -insert link to shark oil here), but we didn’t tell you that when we got back to Rodadero from Palomino my mum realised that she had forgotten a dress and he drove back and got it even though Palomino is an hour and a half away! We also told Javier that we were trying to find a Spanish teacher for my dad and he said he’d ask a friend of his who had retired after working as a professor at the university. Next thing we knew, this professor turned up at our house with his grandson to say that he wanted to apologise in person that he couldn’t teach us because he was a geography teacher, not a Spanish teacher. 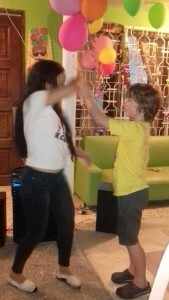 But he was so sorry not to help that he said he would be happy to give me and Brae free geography lessons and do anything else to help us feel at home in Santa Marta. He even went with my mum to help her set up a Colombian mobile phone! 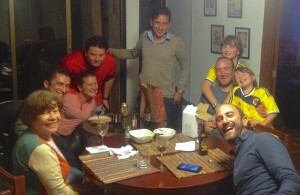 If I wrote about all the amazing, generous Colombian people (for example, Maryline, Camilo and Jose, Laura and her family, all my mum’s friends from work, Guillermo, all the wonderful teachers and families from our school like Luis, Shamir and Alasha…) it would take a day to read this post, so I will have to leave lots of things out. But I can’t finish without telling you about Diana. 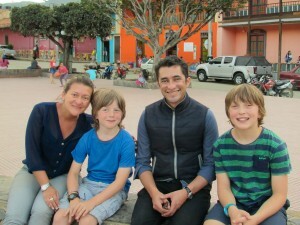 Of all the people in Colombia who were nice to us, our friend Diana and her family were the most kind. 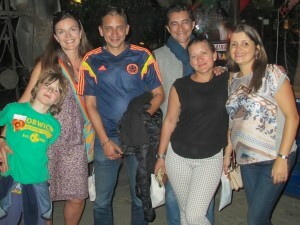 We met Diana in London when we were very young, and she has felt like our Colombian family ever since. At the end of our time in Colombia we went to stay with Diana and her husband Ernesto in their apartment and they looked after us so well when we spent a week with them. They both cooked us amazing food and took us to great places. 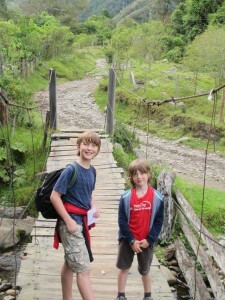 We also saw Diana’s brothers Luis Fernando and Iván every day and also their mum and cousin. 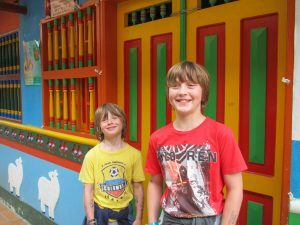 Luis Fernando took us to an amazing show at the theatre and to lots of nice restaurants and showed us around the city, Iván bought me and Brae Colombian football shirts and taught us all about the Colombian football team and Diana and her mum taught us how to make Colombian food. 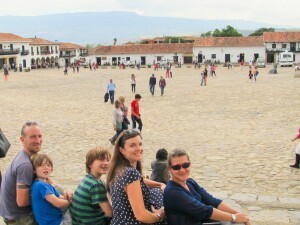 Her family has done so many nice things for us that we can’t write them all but I should tell you that Diana and her family seemed to have every second of our time in Bogotá planned with lovely things to do so my family and I would have the best and most memorable time. It was really sad to go and we didn’t want to leave her. 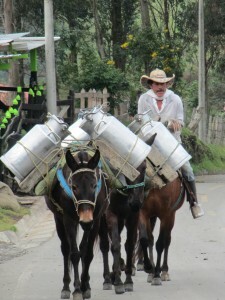 One of the things that Colombia is most famous for is coffee. 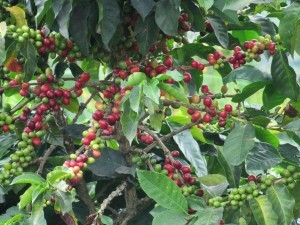 When we went to the coffee region, we went to a coffee farm to learn about coffee (there’s a lot of coffee in this post already!!). The man there even spoke English and so he said if we wanted we could have our tour in English and we did. Before the tour we had some drinks and we were looking at the amazing view. 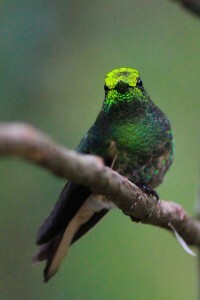 It looked so bright green because we had not seen anything green for months because there is no rain in Santa Marta. 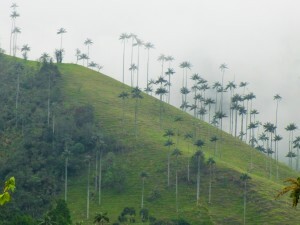 On the hill you can see small coffee plants growing and in between them there are some rows of tall plantain trees which the workers pick for extra money because coffee isn’t a very well paid job, and the plantain also gives the coffee plants shade to make them grow a lot taller. 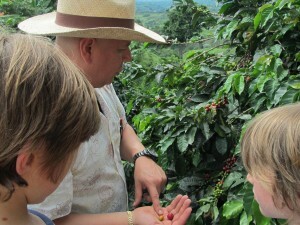 On our tour, we went into a forest of coffee trees and our guide showed us that first the tree makes a flower, and then the flower falls off and a small berry starts to grow. It’s green at first and then it gets bigger and finally turns yellow and then red. He said that you could only pick them when they are red and that even if they fall on the ground you still have to pick it up in case an insect comes and lays eggs. 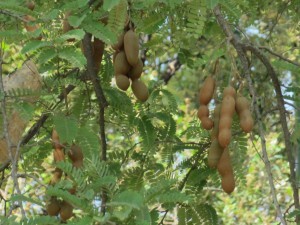 He also said that there were some trees that only ever got yellow ones and that when they were yellow they were still ripe. 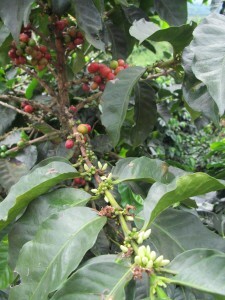 The coffee grows all year round and you have to pick it every time there are lots of ripe berries. 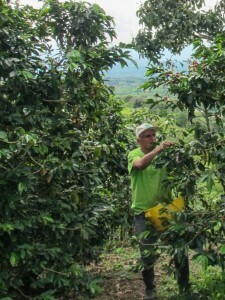 That happens every few weeks and the day we went we saw some people who lived nearby who had come to pick the coffee for their job. 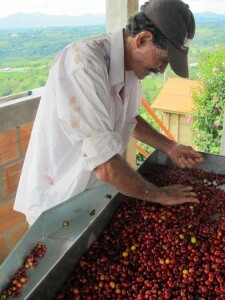 Next he took us into a little house-like coffee factory. Upstairs there was a metal bowl with lots of coffee beens in and there were some floating but most were at the bottom. He said that even if they were red if they were floating they were not good so he threw them away. The ones that sink were washed and put out for sorting. 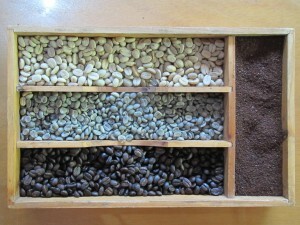 The next part of the sorting happens in a giant metal tray with no water in but with tons of coffee beans. At first there was a man there sorting them out but then he left and our guide said we could have a go so we did. 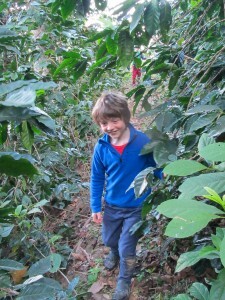 We took out beans that were unripe or damaged and we quite enjoyed it. After they had been sorted they were put in machine to peel their skin off. 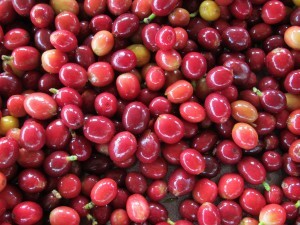 Inside the red case are two pale coffee beans. 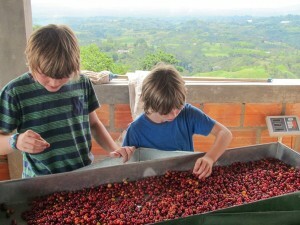 When you first peel the skin off there is a kind of slime on the coffee beans so they are left in water until the slime washes off. 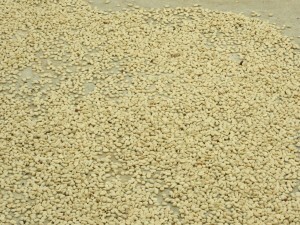 Then they put the beans in a warm room in little trays to dry. 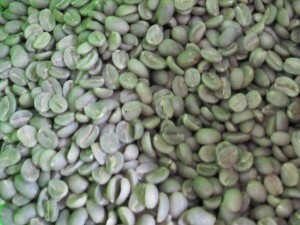 When it has dried it still has a very rough cream coloured case around the beans inside. They use another machine to get the case off and you finally see the coffee bean inside and we were surprised that it was kind of grey-green. 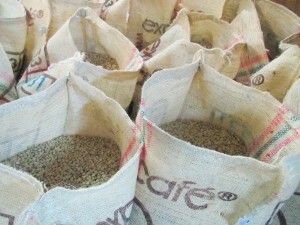 Last of all they roast it and it turns brown like the coffee that we are used to seeing. It smelled really nice when it had just been roasted so we wanted to try it. We all had some coffee and me and Oren didn’t like it but my mum and dad did. So now we know the story of a coffee bean and you do too. 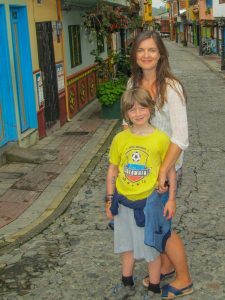 Before I finish this post, we think we should probably say now that we’re not really ‘EverettsinColombia’ any more because we’ve been back in the UK for almost a week! 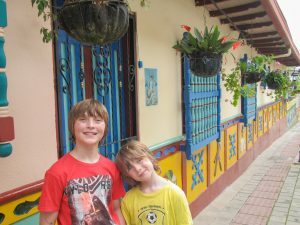 But we’re still writing the blog because we haven’t finished telling you about all the amazing things we did in our last few weeks in Colombia. Please keep reading because our final post is going to be something special. 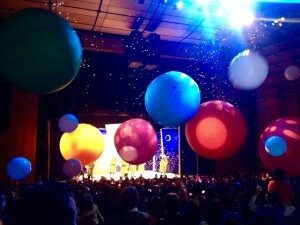 If you really don’t want to miss it, sign up for updates by putting your email address into our blog! 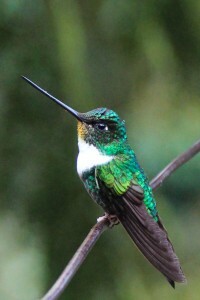 About half way through the walk there is a humming bird place called Acaime so we were looking forward to it. We had booked a guide but when we arrived he wasn’t there so we asked some people where he was and they said that he was drunk so he was very late. After we heard that we decided that it would be best to go on without him. After we set off the view changed a lot and we were enjoying it because it was beautiful. 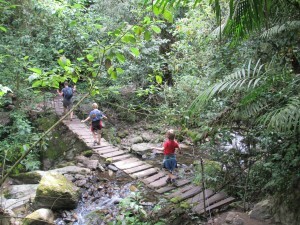 We also passed over lots of rickety broken bridges along the path. After we had been walking for about two hours we reached Acaime and my feet were hurting a bit so that was a relief. 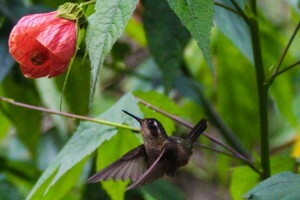 We thought it would be an enclosed area where there were a few humming birds quite a long way away, but it was way better than that. 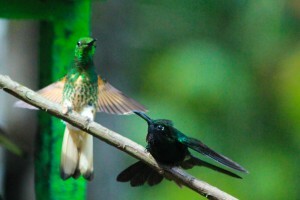 The sanctuary was in an open space in the middle of the jungle where they had some feeders with nectar in. 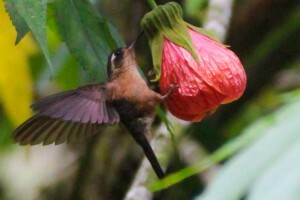 The nectar made so many different birds from the jungle come down to feed and you could stand just about a metre away from them! 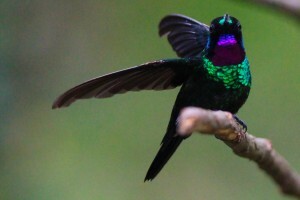 There were literally loads of shimmering humming birds flitting around like lightning on the feeders and on all the branches and flowers around us!!! After we had stayed for nearly an hour and a half we decided we should probably go but our minds were still full of colour and light. After Acaime we had to re-trace our steps a little bit and we came to a mountain path which was the next part of the route. 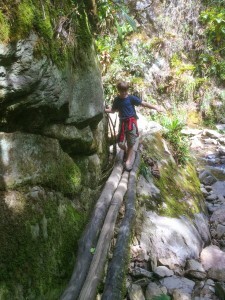 It was an extremely steep bit and we struggled. 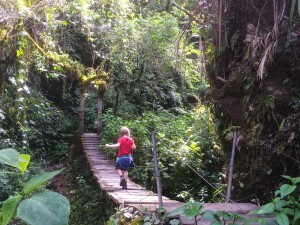 Brae didn’t though because he went as fast as a mountain goat, but because of my altitude sickness I went slowly. When we reached the top it was a relief because we were all tired by that point. We looked at the view over the valley but we couldn’t see much at first because of the clouds (we were so high we were right inside them). We had a big rest up there and then we set off again on the downhill part of the journey. 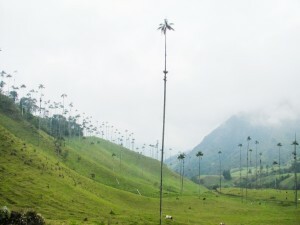 My dad had told us that on the walk down there were palm trees that were sixty metres tall, but we didn’t believe him. Sixty metres is about 30 tall men standing on top of each other! When we got to the bit where the palms were supposed to be we saw some that were thirty metres tall so we said to him: “Told you that they weren’t sixty metres tall”, but then we turned a corner and saw palms that really were around sixty metres tall! 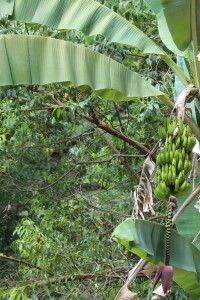 It was hard to see the tops of some of them because they were so high. You can see how small the cows look! I felt amazing that I did it and I felt that I could do anything now I have completed the walk, but I was exhausted. My mum and dad were really happy and proud of us. 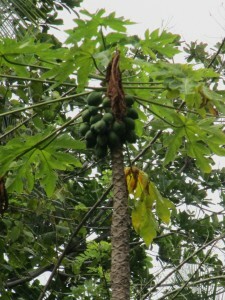 On the same day in Panaca we saw some small trees with big green things that looked like aguacates at first, but a sign it said that it was maracuyá. 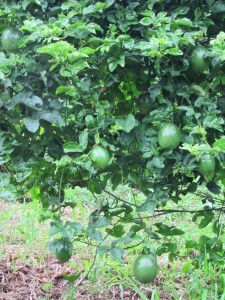 We didn’t know maracuyás grew like this either so it was good to find out. One of the things that my mum says she is going to miss a lot about Colombia is just walking around and noticing all the tropical fruits growing around us. 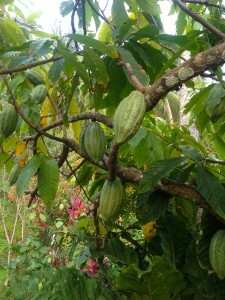 There are mango, lime, papaya and tamarind trees, cocoa and aguacates and bananas. They grow in the jungle but they also grow in people’s gardens and in fields, all along the road, growing in the pavement, in parks. 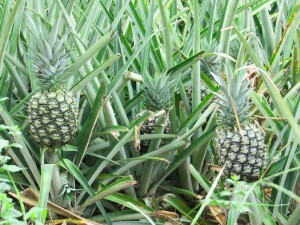 In fact, tropical fruit is growing everywhere you look! 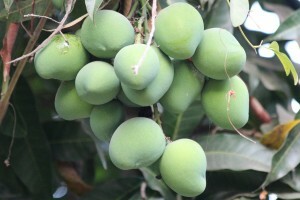 Mangoes – we wish they were ripe! In Colombia they use a different type of sugar to in England. 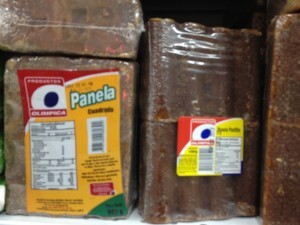 The first time we went to the supermarket we saw a big section in one of the aisles of blocks of things called panela, but we didn’t know what what it was. We looked it up and found out it is a type of sugar and it is made out of sugar cane. 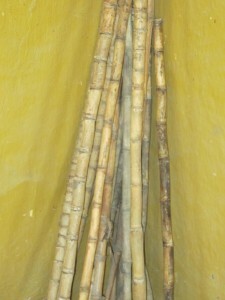 Sugar cane looks a bit like green bamboo when it grows and then the stalks turn brown like sticks when they dry. To make the sugar cane into sugar, they just squeeze the sap out of the green canes and boil it until it gets thick and then it cools and sets into these blocks. The sugar we have in England is made from sugar cane or sugar beet and it is made sort of the same way but after they get the juice they do a lot more things to it to make it really white and tiny. 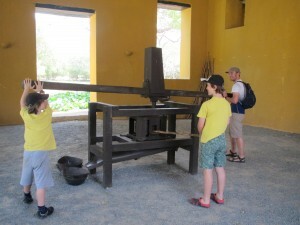 When we went to the farm where Simón Bolívar died they had an old farm building where they used to make panela and we saw the machine that squeezed the liquid out of the cane. 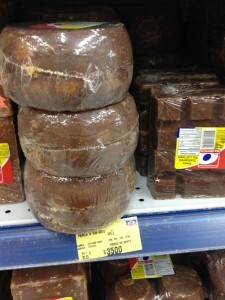 In Colombia, people make a lot of things with panela. They use panela in cooking instead of sugar. 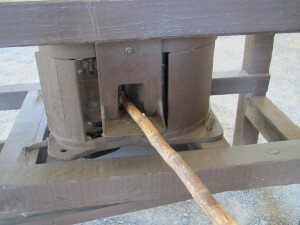 You can use a grater to get sugar from the big block. 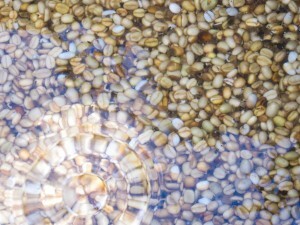 They also often make it into a drink called “agua de panela” (panela water) by mixing panela into water. 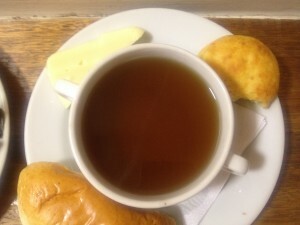 They drink it hot (and serve it with cheese that you can put into the panela water!) or cold. They sometimes add lime into cold agua de panela which I think tastes a bit nicer, but I don’t really like agua de panela because I think it tastes a bit strange. 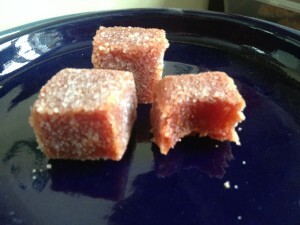 They used to give us agua de panela at school and most children really like it. Today we were packing for the journey home and we have got more than five kilos of bocadillo! The bag is really, really heavy. So that shows how much we like it. I bet you are wondering what bocadillo is. In Spain bocadillo is a sandwich but in Colombia it is a sweet. Bocadillo is cube, light red and quite small. Here is a picture of bocadillo. 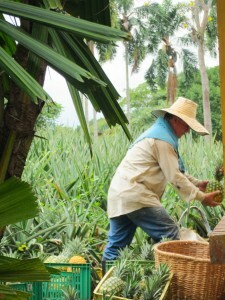 It is a type of food that is made of a fruit called guayaba. 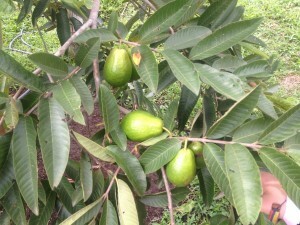 They are green outside and sometimes round and sometimes the shape of a pear. 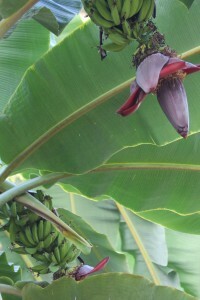 Inside they are pink or red when they are ripe. Bocadillo is made with the inside of a guayaba and some sugar and is cooked slowly until it is thick enough to turn into a block when it cools down. Out of all the foods we have tried in Colombia this is the one that we think that a lot of our friends at school would like the most and maybe you can try it in the Colombian after school club that we are going to run in the summer term. 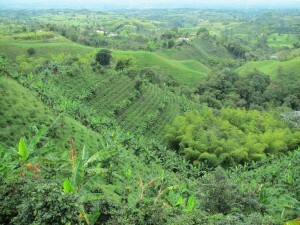 We went to a place in Colombia called Salento, in coffee region. In the town we heard of a place where you can play Tejo, which is the national sport of Colombia. We learnt about the game before we left England and really wanted to play it. 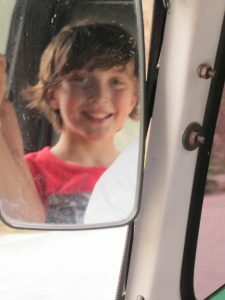 We had tried to find somewhere in Santa Marta but we asked a taxi driver one time and he said the Tejo places in Santa Marta were really just for truck driver, not for children. 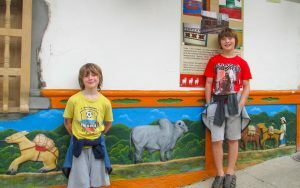 The place that we heard of in Salento was called Betatown and it was OK for children too. 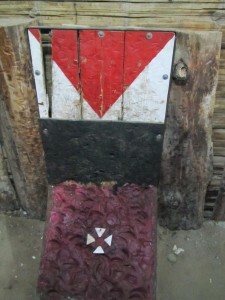 Tejo was invented more than 450 years ago by indigenous tribes. It used to be that you threw gold discs into a hole in the ground. After the Spanish arrived, they liked the game but they changed the rules a bit. 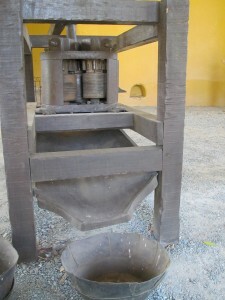 They took the gold away and used iron instead, and they added gunpowder! Now you play Tejo with a heavy disc of metal which you throw about six meters. 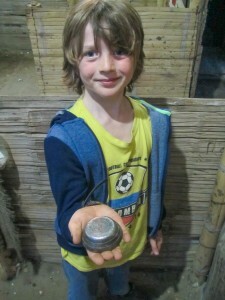 You throw it into a box of clay with a metal ring buried inside and little triangles of gun powder touching the metal. You do not get any points if you miss the box of clay, you get one point if you land in the clay and you are closest to the metal ring, and you get three points if you hit the gunpowder and it explodes. We played in teams of two and slowly got better, in the end we all exploded the gun powder. The gun powder was very loud and with lots of smoke and fire. We enjoyed it so much that we went to play it again the next day. Here are some pictures and videos of us playing. You can hear the rain at the end, because it was a thunder storm. It was the first rain we’d seen for nearly three months so it was quite cool.